You've had so much fun over the years and now she's going to be a bride. This lovely personalized wedding gift will let her know how much you value all of those memories and will wish her well in her marriage. This heartfelt wedding gift is perfect for an aunt to give a niece, a mom to give her daughter, a sister to give her sister, or from one cousin or good friend to another. 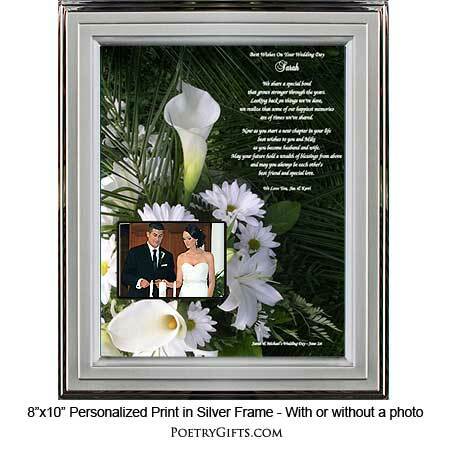 Personalize this beautiful floral print with names, wedding date and a closing message. 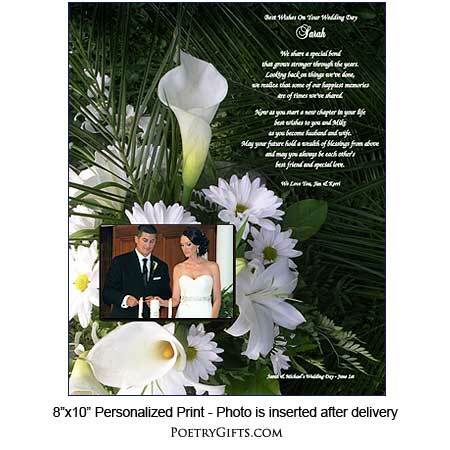 When the bride inserts a favorite wedding photo, this Poetry Gift becomes an exclusive and exquisite wedding keepsake! Searching for a unique and special gift for a bride? This personalized Wedding Poetry Gift is it. The beautiful floral bouquet print and heartfelt personalized poem is a winning combination. 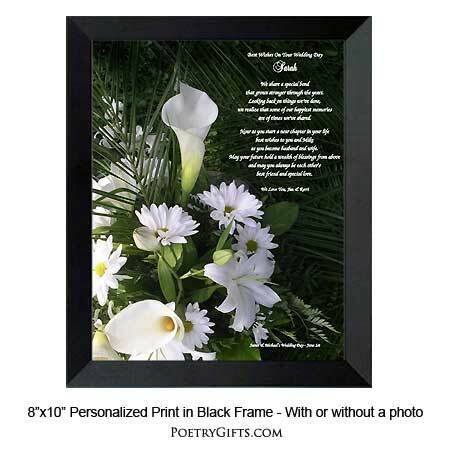 Frame the poem in any standard 8" x 10" picture frame or choose one of our modern photo frames. A Thoughtful, Lasting, and Meaningful wedding present for a sister, niece, daughter or granddaughter. 1. Phrase Above Bride's Name (optional) - Examples: To My Sister On Her Wedding Day, For My Wonderful Daughter, To My BFF, etc. 4. Closing Phrase and Your Name(s) (as seen after poem) - Examples: All My Love, Mom; Wishing You All The Best, Grandma; So Happy For You, Aunt Jenny; etc. 5. Optional Ending Phrase and Wedding Date - Example: On Laura & Tim's Wedding Day - Apruk 15; Jonelle & Thomas - October 5th; etc. as you become husband and wife. best friend and special love.